Slice apples into thin wedges, removing the core. Slice grapes into halves. Cut cheese into thin slices and then into stars. 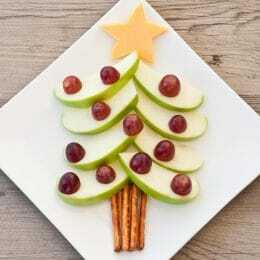 Place ingredients out for the kiddos to assemble trees: use pretzel sticks as the trunk, apple wedges as the branches, grapes as the ornaments, and a cheese star as the topper. Serve with any remaining ingredients on the side.